I was just telling a friend last week that I rarely get sick…then I got sick. Happens every time! Mr. Snotty Pants sat next to me at work during the last two hours on Wednesday, blowing his nose the whole time (seriously, he hardly typed at all because he was blowing his nose so often! ), and I stubbornly refused to move because I was comfortable and there were only two hours left. (You choose your own seat where I work, and there are hundreds to choose from, so I was a little miffed he didn’t choose a seat that didn’t have anyone else around…there were plenty.) But *cringe* I hated hearing that constant blowing into Kleenex’s. And I felt feverish by the time I left work. I worked Thursday and I thought I was fine, but woke up Friday feeling feverish again, and with a sore throat and my entire body hurt. Especially my hips – it was hard to walk. I called in sick, and didn’t work Saturday either, feeling even weaker and more feverish. (I don’t know if I had a fever because my thermometer kept saying my temp was only 97 degrees…I think it may be broken). 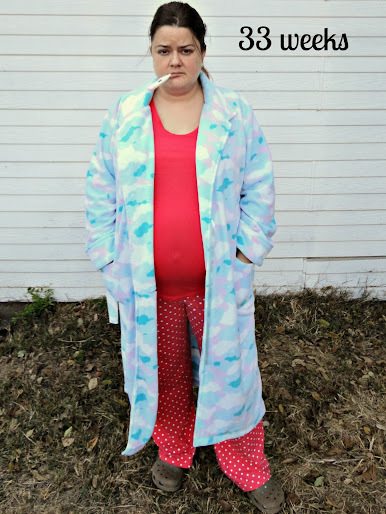 I didn’t go to church on Sunday and I didn’t want to get out of my PJ’s for my weekly pictures so I apologize for being in them again – I just didn’t feel good enough to try to put on a pretty face for you this week – lol. I have a lot to do this week in preparation for my baby shower (I know I’m weird, but I couldn’t help getting involved! Control freak, much?) so I’m praying I feel great when I wake up on Monday (I’m writing this Sunday). I don’t have any more days I can spare to do nothing! Oh and I have a Daddy update for you – Dennis did Via Christi’s Boot Camp for New Dads. I didn’t get a pic of him with his certificate yet so I’ll share that next week. I’m so glad he did that – I know it will help him a lot! Three veteran Dads who’ve done the class and now have their babies come to the class with them in tow so the soon-to-be Dads can ask questions and observe how to handle a baby, while the pros teach them how to diffuse stress, help mom, form a family bond, survive a crying baby, etc. We are both doing the Happiest Baby on the Block class in November to learn how to calm a crying baby. 33 weeks down, 7 to go. How do you manage to look cheerful when you’re sick? Hope you’re feeling great this Monday morning. I got really sick over Thanksgiving weekend when I was pregnant with Hannah. My sister ended up going to a friends house, and my parents went to visit my brother. It was so weird being all by myself for Thanksgiving, but I didn’t want to move! 7 weeks – eek!! It will be here before you know it! I hope you’re 110% soon, V! I have no idea but it’s gotta be doubly hard when you’ve got baby in belly too :( Sending you warm wishes, beautiful mama! Im so sorry you have been sick! Sending prayers that you feel better very soon. The baby classes sound great! Hope this passes quickly and you are feeling great again. What – only 7 weeks to go? It’s almost here!!! Why did you have to go and jinx it? Ah well. Hope you’ll be better and as perky as your belly button right soon! Feel better soon, being sick is the worst!!!!!! Aww I hope you feel better soon girl! Make sure to stay hydrated!! Heyа i am for the first time here. I found this bօard and I find It truly useful & it helped me out much. I Һοpe to give something back and help otherѕ like you aideɗ mе.